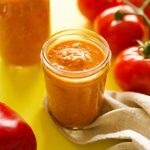 This Easy Romesco Sauce recipe is a fast blend of tomatoes, roasted red bell pepper, almond butter, and spices. It takes just 5 minutes to blend up and is packed with so much flavor! Going to the school during the week means most of the cooking I do is reserved for weekends. Which means by Sunday night, our fridge is the holder of many colorfully tasty culinary experiments, squeezed into whatever jar or container I can find to hold them. And having a fridge full of experiments means that when the potential buyers of your home come look at the kitchen and ask if they can peek inside the fridge, I quietly hide behind a corner so as not to see their reaction to the living experiment that is the fridge. Anyways, the boyfriend-tulip-man and I have finally got the ball rolling on moving into a bigger house. We’ve lived like two big hermit crabs in the same itty bitty shell for a year and a half and it’s about time we move into a bigger shell (related). Which means that (hopefully) soon I’ll have the space to experiment with every sauce under the sun. But until then, I’m sticking to the sauces I know and love. Case in point, this Easy Romesco Sauce. I’ve always been a bit hesitant to try new sauces because they have the potential to be so finicky, but romesco sauce is virtually foolproof. Coming from the Catalonia region of Spain, it’s a quick blend of roasted red pepper, tomatoes, lemon, garlic, almond butter, spices, and olive oil. It tastes and feels decadent without the saturated fat-laden guilt you’d usually find in a sauce of this tasty magnitude, perfect on everything from pasta to eggs. 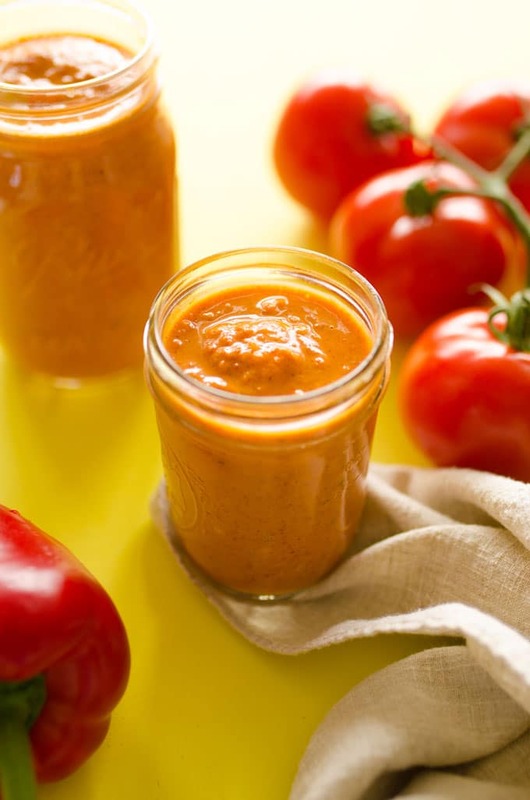 This Easy Romesco Sauce recipe is a fast blend of tomatoes, roasted red bell pepper, almond butter, and spices. Takes just 5 minutes and packed with flavor! Add all ingredients to a food processor and blitz until smooth. Serve warm or cold with just about anything...crackers, veggies, pasta, whatever! This post contains affiliate links, which means if you make a purchase after clicking a link, I may earn a commission (at no extra cost to you!) 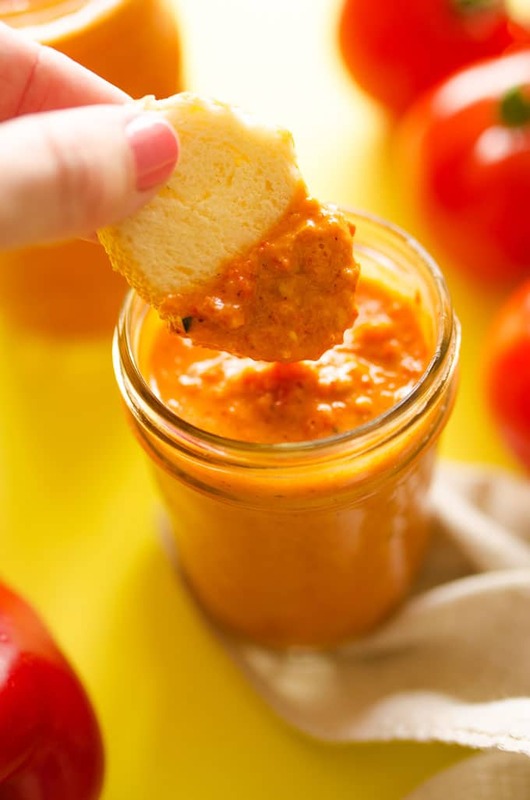 Thanks for coming by and for making recipes like this Easy Romesco Sauce possible!